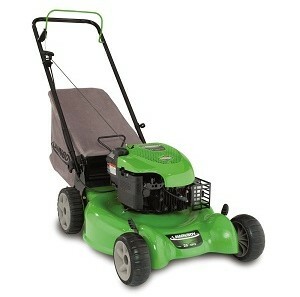 The Lawn Boy 10640 is a very good, mid level gas powered mower. It does the basics VERY well. Yeah you don’t get all the bells and whistles like on the higher end gas models, but so what. Do you need them? This model is really solid for the money, in fact probably the best value construction out there. You’ve got a nice steel 20 inch cutting deck which is not too small but sufficiently big to get a nice amount of grass cut on each pass. We should point out that it is a push mower, there’s no self propel feature, but to be totally honest you don’t really need one as at only weighs 66lbs and is easy to push.You can bag, mulch or discharge with this mower. It’s up to you. As you can probably tell we do rate this model highly and now you’re going to find out why. Quality construction – The entire functional deck is made of steel. Both the front and back areas where the wheels and height adjuster is attached are also made of steel. Oh, and the brackets at the base of the handlebars where the grass bag locks into are also made of steel. You are not relying on plastic components here. Its looks and feels really solid. Briggs & Stratton engine – These engines are brilliant and very reliable if you maintain them properly. You should get many seasons of use with this engine. This 190cc engine also gives you plenty of power and can deal with long, thick or damp grass really well. Easy to start – There’s no choke or priming bulb on the model. The engine comes with “ReadyStart” technology and all you have to do is pull the cord and the mower comes to life. It’s a reliable starter and starts in the first two pulls. Wide tires – These give you more control then you’re mowing. They make it especially easy when you are turning the mower around obstacles or at the end of a pass , but they also flatten more grass on each pass. This might mean you have to overlap a bit more than normal. Wider cutting height range – You have multiple options at your disposal here, anywhere from 1”- 4”. This is great as it’s really unusual for a mower in this price bracket to be able to cut to 4”. You should definitely find the setting that is right for you among that lot. The mechanism you need to use is spring loaded, and the spring is quite strong. This does make adjusting the height quite difficult. There’s not much to it really. Just attach the handle, add the oil and gas and you’re ready. It should only take you 10-15 minutes tops and you won’t need any tools or anything. Cutting Ability – The engine gives this mower the power to do the job, allowing it to cut evenly and cleanly and it also does a good job at cutting up other debris such as leaves. The mower will cut damp grass effectively but the clippings do tend to stick to the underside of the deck. If you do choose to mow in these conditions then you really should clean the underside of the deck after you have finished mowing.This will prevent a grass build up which could affect performance. Also worth noting is that this mower does produce quite a lot of vibration and it doesn’t have any padding on the handle, so you can get “numb hand”. There is a simple way to improve this. Just add some padding onto the handle and it will vastly reduce the vibration. It doesn’t use as much gas as a lot of the older models used to either. Mulching Ability – This mower can mulch, bag or discharge but it does mulch extremely well. Keep the bottom of the mower clean and it will do its thing. Manoeuvrability – At 66lbs this mower is fairly light for a gas mower. It’s easy to push and move around your lawn. Grass collection – The clippings can tend to get clogged up in the opening so the mower doesn’t bag well. We do have a little tip for you here. Mow for a couple of minutes and then just stop, take off the grass bag, shake the clippings to the back of the bag and then carry on. This should ensure it bags more evenly after this point. If you really want the extra power that a gas mower offers but you’re on a tight budget then the Lawn Boy 10640 is one you should definitely be looking at. Too many models these days use cheaper plastic components to keep costs down, but they aren’t as durable.So it’s refreshing that this mower has a real solid steel construction. It looks solid when you look at it and feels well built when you use it. It’s durable, reliable, simple to use and has the power to cut through most things. And best of all its extremely affordable!